The State Historical Society of Missouri is developing a new online Missouri Encyclopedia for the Missouri Bicentennial. To be comprehensive, the editorial team needs your help. Who are the people and what are the places and events that shaped your community, your county, and your region? Contribute topic suggestions online. The Missouri Encyclopedia seeks to provide concise, informative articles on subjects significant to the history of Missouri and its region. This online resource for general audiences will launch in 2021. Visit the website or download the flyer for more information, including writer’s guidelines and sample articles. The intersection of Missouri Highway 11 and Route Y in northeast Missouri, facing northwest. The State Historical Society of Missouri has launched two new programs exploring Missouri’s history and culture at the occasion of its bicentennial in 2021—the My Missouri 2021 Photograph Project and the Missouri 2021 Endorsement Program. The My Missouri 2021 Photograph Project invites professional and amateur photographers to submit their work for an exhibition that will run during the bicentennial. Two hundred images will be selected and exhibited at the Society’s future headquarters building in Columbia and other sites around the state in 2021. The photos will also be featured in a digital collection on the Missouri 2021 website. The project will create a lasting visual retrospective of the state’s physical and cultural landscape at the time of its bicentennial. The 200 selected photos will become part of SHSMO’s permanent bicentennial collection, where they will remain available to researchers, teachers, students, and the general public. The Missouri 2021 Endorsement Program creates a media partnership with local organizations seeking to develop and host their own bicentennial activities or to brand existing community offerings for the bicentennial year. Endorsed programs and events receive acknowledgment from the State Historical Society and are granted permission to use Missouri 2021 logos according to established guidelines. Endorsed programs or events will also be publicized on the Missouri 2021 website. See the current list of projects. The materials used to repair and store historic maps such as this one can affect how the item ages. The State Historical Society of Missouri received an overwhelming response to its call for 2018 Brownlee Grants applications. SHSMO received 55 submissions from 33 different Missouri counties requesting funding from the available pool of $5,000. Ten institutions received funding, largely for the purchase of archival supplies. 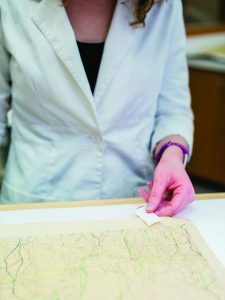 The Society’s conservator, Erin Kraus, said she is encouraged that so many institutions applied with the intent of expanding their conservation efforts. “Storage materials can make the difference between objects lasting for centuries versus just decades,” she said. Grant recipient Kathy Smith, executive director of the Historical Society of Lee’s Summit Museum, said the museum will use its award to extend the life of its collections and control the effects of past flooding. The museum also experiences ongoing water issues in its historic building, a former post office built in 1939. To help control the problem, the museum has worked with a conservator recommended by the Nelson-Atkins Museum of Art to develop a plan for the site and to eradicate mold and mildew. But like many organizations, the Lee’s Summit organization has more needs than funds. In addition to the Historical Society of Lee’s Summit Museum, 2018 Brownlee Grants are supporting the Cape River Heritage Museum in Cape Girardeau; the Rusche Park Board of the City of Marthasville; the Friends of Historic Boonville; the Hallsville Historical Society; the Harrison County Genealogical Society in Bethany; the Macon County Historical Society Museum in Macon; the Missouri Pacific Historical Society in St. Louis; the Reynolds County Museum in Ellington; and the Stone County Historical and Genealogical Society in Galena. The State Historical Society of Missouri plans to offer Brownlee Grants in 2019, and bicentennial projects will again be an area of focus. Watch SHSMO publications and the website for the call for proposals, which should be announced this fall. Hannah Scott of Odessa is a three-time winner of the Show-Me Prize. She received the 2014, 2015, and 2017 awards for senior individual exhibit. 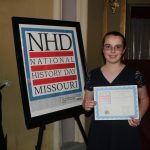 The State Historical Society’s Show-Me Awards encourage National History Day in Missouri students to investigate a key development in Missouri history or explore how a Missourian contributed to a significant national or international event. Students chosen for the awards receive $50, learn more about their state, and have a chance to see their work included in Missouri’s bicentennial observances. 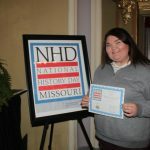 The awards were created in 2014 to promote engagement with Missouri history among National History Day participants and to raise awareness of the upcoming 200th anniversary of Missouri joining the Union on August 10, 1821. 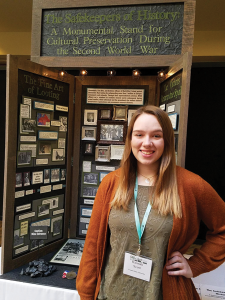 Each year, the State Historical Society of Missouri issues up to five awards of $50 each to students presenting individual entries on Missouri history topics in the senior division of the state competition. The award recipients grant the Society permission to showcase their National History Day projects in promotional efforts for Missouri’s bicentennial. Students must apply for the awards in order to be considered. Learn more about special prizes through the application. Be sure to have students apply before March 30.